The electric motor for the cooling fan may continue to operate or start up when the engine is not running and can cause serious injury. Keep hands, clothing and tools away from the rotating fan blades of the cooling fan. The electric motor for the cooling fan is controlled by engine coolant temperature, refrigerant pressure and vehicle speed. 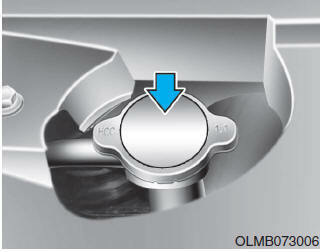 As the engine coolant temperature decreases, the electric motor will automatically shut off. This is a normal condition. If your vehicle is equipped with GDI, the electric motor for the cooling fan may begin to operate at any time and continue to operate until you disconnect the negative battery cable. 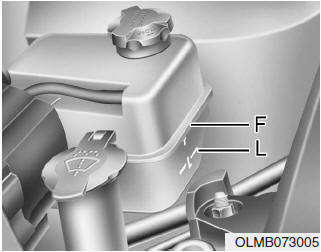 The coolant level should be filled between the F and the L marks on the side of the coolant reservoir when the engine is cool. If the coolant level is low, add enough distilled (deionized) water to bring the level to the F mark, but do not overfill. If frequent additions are required, we recommend that you see an authorized HYUNDAI dealer for a cooling system inspection. When adding coolant, use only deionized water, distilled water or soft water for your vehicle and never mix hard water in the coolant filled at the factory. An improper coolant mixture can result in severe malfunction or engine damage. 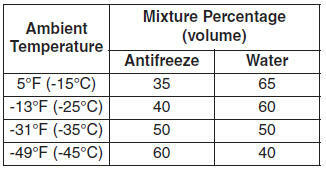 If in doubt about the mix ratio, a 50% water and 50% antifreeze mix is the easiest to mix together as it will be the same quantity of each. It is suitable to use for most temperature ranges of -31°F and higher.